Two years ago, at the inaugural Nike Team Nationals, there was a substantial buzz surrounding a school from upstate New York believed to be one of the top boys’ teams in the nation. Fayetteville-Manlius (F-M) was the perfect match for a nascent, countrywide team competition—a tight pack with no superstars and a legendary work ethic. That team placed second to an equally vaunted York squad in 2004, and returned in 2005 to place 3rd behind Saratoga NY and York (on a tie-breaker). This year F-M was back, as the Manlius XC team, but it was the girls, not the boys, who toed the line. 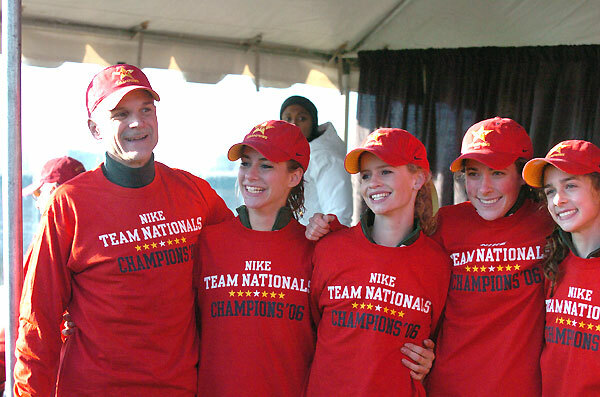 And it was those girls who delivered Coach Bill Aris his first national title in his third attempt. Even during pre-race introductions, Aris’ young charges were all business. While some teams smiled or joked among themselves as they jogged from the introduction paddock to the starting line, the Manlius girls were grim-faced and determined. That razor focus was on display early, as Mackenzie Carter and Kathryn Buchan got out strong, infiltrating the top ten in the first kilometer. The team was in 5th at that point (180 pts), with live scoring updated on massive screens alongside the track. Hilton (NY) XC club was listed in first place, with 115, followed by Westfield (Indiana) with 144. By the second checkpoint, Manlius had asserted itself, surging to the lead in the team standings with 147 to Westfield’s 172 and Newport’s (Corona del Mar CA during the season)187. A chip error, undiscovered until after the race, resulted in Hilton being dropped from the live scoring updates, though they were more than holding their own on the muddy course. Manlius, with Carter (4th 19:33.1) and Buchan (5th 19:35.6) continuing to lead the way, fronted the field at each of the two remaining checkpoints, but a chaotic final kilometer still left the finish uncertain. Manlius’ 3rd runner (Jessica Hauser) crossed in 29th, by which point Westfield had scored their first four. Westfield’s 5th wouldn’t cross until 123rd, however, which handed the battle up front to the two NY schools (Manlius and Hilton) and a surprising Carroll (Texas) XC squad. Manlius’ fourth through sixth scorers shut the door on the competition with their 44th, 46th and 48th placings, and suddenly the girls who lingered in the shadows of the F-M boys for the last two years had struck elusive gold. On the victory stand, the team described the moments after the win as “absolute euphoria.” Their coach said he had found inspiration for the team’s race plan in a favorite rock band. Carroll was declared the initial runner-up, before the chip error plaguing Hilton was resolved. After a short delay to sort out the scoring, Portland Meadows had its second straight 1-2 New York finish: Manlius 128, Hilton 178, Carroll 187. One key to Hilton’s finish was the gutsy effort of top runner Allison Sawyer, who led the first 4k before losing a shoe and fighting to hang on for third. The individual race was as thrilling as the team battle, with several lead changes in the last mile. Sawyer fronted the strung out pack into the final furlong, but lurking nearby was defending NTN champion Betsy Bies (Yankton XC) and Ashley Higginson (Colts XC), both of whom had nailed down Foot Locker berths in their respective regionals a week earlier. Bies, hungry for the repeat win, pounced as soon as the daunting mud gave way to firmer ground. “I tried to focus on running as fast as I could when I could, because you can’t really do anything in the mud. Our coach said, ‘If you guys want to make a move you have to do it on the grass.’” Bies did, seizing the lead with a move that looked to be a race breaker. By then, Sawyer’s shoe had been claimed by the thirsty muck, and Higginson saw an opportunity as well. “Sawyer lost her shoe,” Higginson said after the race. “I saw that and I was thinking, ‘That’s hard for her, but I’ve got to go for this now. Maybe I can get Betsy if I really go for it. One point could make the difference.” A powerful, decisive move carried her past Sawyer and Bies into a lead she never relinquished. If any words were necessary, it may have been the four offered by Coach Aris to explain his team’s triumph in the blisteringly competitive field. And that’s a hard combination to beat. wait, Carroll's in second, 162! Then Newport, Westfield, Yankton, Colt's, Phoenix, Wilmington, Greenbelt and Hilton - any one of the top ten could have it! interval 3 - Everybody's in contention! Manlius 143, Newport 189, Yankton 208, COlt's NEck 213, Phoenix 234, Wilmington 250, Greenbelt 253, Hilton 254!! really close!